Last November, we published a blog post on Project management in an SME in which we explained why this topic is becoming more important to companies, and why the company has to continuously adapt to new challenges. But further developing project management methods is just one aspect of what handling projects entails. Other basic concepts are just as important, such as being able to make an informed decision on the next project to which the company should turn its attention. There’s no shortage of promising ideas and compelling initiatives out there. But which project makes the most sense right now, in the medium-term, and in the long-term? Where will our limited resources be channeled next? Do these projects align with our corporate strategy and annual targets? Projects that tie up resources should always ‘pay into’ these objectives. Ultimately, you have to establish a type of project portfolio management that helps you to make decisions for or against a project. The prerequisite for making this decision is having a transparent overview of all planned and ongoing projects. This in turn works particularly well when all decision-makers can SEE what’s on the table, and what it’s about. Humans are very visually oriented. For that reason, a system that clearly visualizes connections, dependencies, bottlenecks, and synergies is advantageous to the desired project portfolio management. But how can Kanban help with setting up project portfolio management? 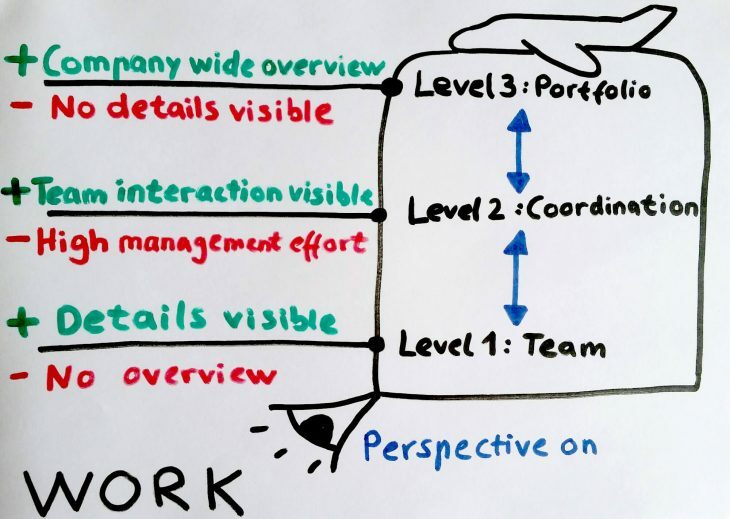 The key lies in the fact that it isn’t (just) oriented towards teamwork, but that it can be scaled to the portfolio level, in contrast to Scrum. The Flight Levels model developed by Klaus Leopold and Siegfried Kaltenecker is the most prominent example of a scalable Kanban model. These ‘Flight Levels’ refer to a figurative bird’s-eye view from different heights, applied to how I look at a company’s work as an observer. If I fly too high, I have an overview, but no in-depth information. If I fly too low, I can see the in-depth information, but don’t have an overview. We needed a high flight level. FlightlevelsThe establishment of a portfolio Kanban system (Flight Level 3) has recently made an effective and adaptable system available that provides a visualized overview of the pros and cons when making a decision on a project. Much has already been gained, even though the system is still in development (at Kanban, the board is always changing). We are now actively working on continuously orienting our project portfolio to company targets. A series of regular meetings (stand-up meetings, refill/replenishment meetings, retrospective meetings) serves the purposes of fostering an ongoing conversation about what the company needs next. Here, Kanban also helps us to limit the number of projects to a reasonable amount so that the company is not overburdened. This is a trap that any growing company can quickly fall into. In the meantime, team Kanban (Flight Level 1) is being introduced step-by-step within MailStore departments. It was important to us to introduce Kanban in workshops together with colleagues, accompanied by intensive reflection on the working methods used up to that point, instead of imposing a system on them. The further development of boards, and the meeting culture related to it, is constantly progressing. Kanban promotes a mindset directed at completing tasks and projects, and engendering values, instead of constantly starting new initiatives. That helped us a lot. 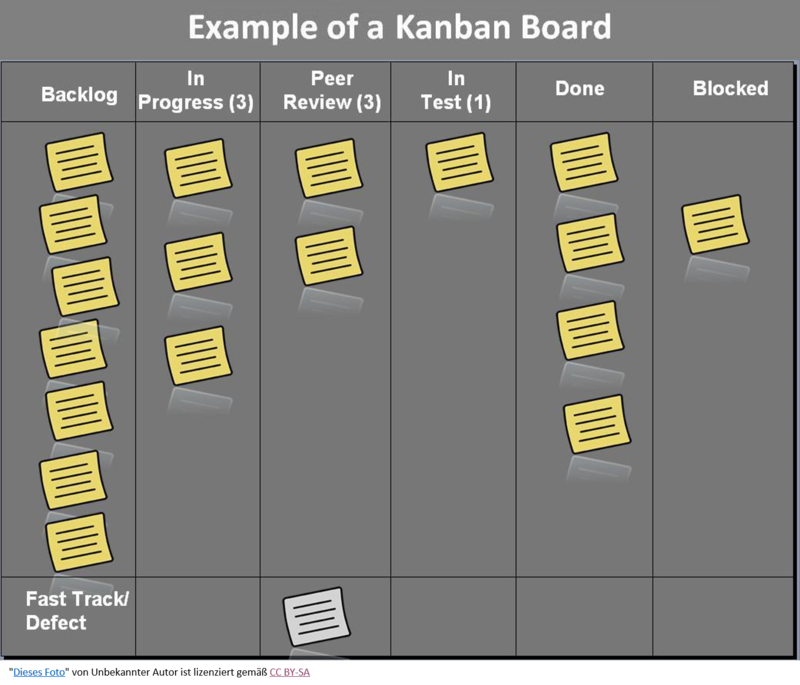 We have already been able to chalk up many positive effects to using Kanban. Perhaps the most important is the realization that the way that we work together isn’t a law of nature. It can be scrutinized and reshaped. The way that work is visualized by using Kanban has been laying the foundation for improving workflows, and disrupting entrenched patterns. Despite this success, we have only just begun our Kanban journey. Where will the next stage take us? Learn why project management is an important factor in your company’s success.